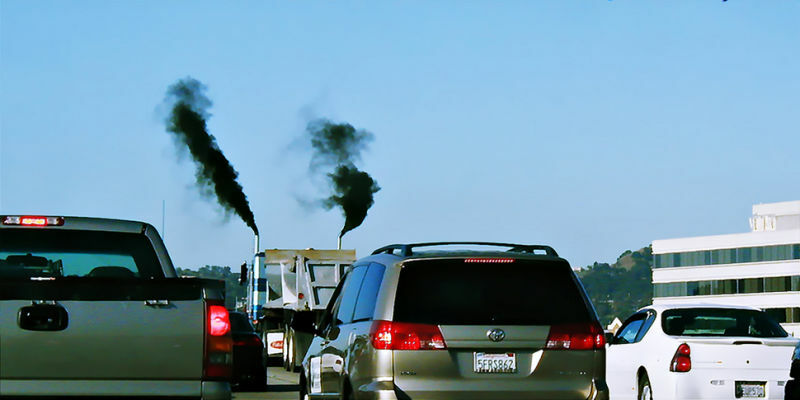 Air pollution kills thousands of Americans every year, even at levels far below the current legal limits set by the Environmental Protection Agency. That’s the conclusion of the largest study of its kind ever done, performed by the Harvard School of Public Health and published last Thursday in the New England Journal of Medicine. It comes only a month after the Trump Administration signaled a willingness to roll back those current limits. “Air Pollution and Mortality in the Medicare Population,” has six authors headed up by well-known Epidemiologist Joel Schwartz, of the T.H. Chan Harvard School of Public Health. Researchers could find no sign of a “safe level” of exposure to either Ozone, aka Smog, or Particulate Matter 2.5, aka Soot at a microscopic level. For every 1 microgram per cubic meter (µg/m³) reduction in Particulate Matter pollution, 12,000 lives were saved annually. For every 1 ppb of ozone reduction, 1,900 deaths were prevented. Size: The study followed over 61 million American seniors in the lower 48 contiguous states, representing 97% of all Americans 65 or older, for 13 consecutive years, 2000 to 2012, totaling 420 million “person-years” of follow-up and analysis. 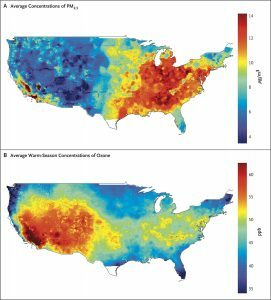 Accuracy: Researchers developed an entirely new computer model to do the study, combining on-the ground air-monitoring data and satellite-based measurements to estimate pollution levels across the continental U.S at a resolution of 1-square-kilometer. Most current air computer models, including the ones used to predict DFW smog levels, run at a level of 5 to 10 kilometers square. Telescoping in at the local level gave the authors the ability to estimate the levels of smog and ozone level exposures to seniors by Zip Code. Men, Blacks, Asians, Latinos, and lower-income seniors all faced increased risk of death from exposure to Particulate Matter. Black seniors were three times more likely to die from PM exposure as the senior population as a whole. Since the Clean Air Act (still) requires the EPA to set air quality standards that “protect sensitive populations,” a number of Environmental Justice issues, and lawsuits, might arise from the study’s findings. Extremely Low Levels of Pollution: With Particulate Matter, the study saw a significant increase in the risk of death rise when seniors were exposed to as little as 5 micrograms per cubic meter (µg/m³), the lowest level measured. The current EPA standard for PM exposure is 12 µg/m³. Ozone levels as low as 30 parts per billion, also the lowest measured, increased the risk of death as well. The current standard is 75 ppb, with a planned phase-in to a 70 ppb level approved by the Obama Administration in 2015 now seriously in doubt. Seniors’ chances of dying decreased every time PM levels were decreased. However, in a strange indicator of just how harmful lower levels of pollution are, their chances of dying decreased more when those PM levels decreased BELOW the current standard of 12 µg/m³. That is, more lives were saved by cutting PM levels back from 12 to 5 µg/m³ than from say, 17 to 12 µg/m³. 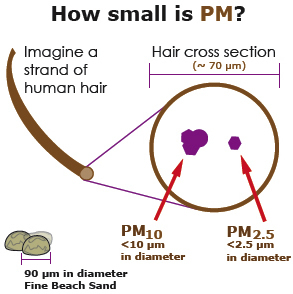 PM and ozone both are primarily caused by combustion – whether it’s from engines in cars and trucks, furnaces in power plants and cement kilns, or diesels running gas and oil pipeline compressors or locomotives. DFW annual PM levels have averaged anywhere from 8 to almost 12 but we’ve gone over the 12 µg/m³ annual standard a number of days every year. In this 2013 study both Fort Worth and Dallas had almost 80 days above the national annual standard. Despite its impressive size and scope, the study gives only a partial view of the public heath damage done by air pollution. It only looks at the impacts on those 65 and older. 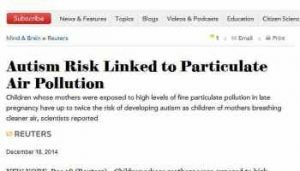 Left out of its analysis are children, whose lungs are more sensitive because they’re not fully developed, and everyone under 65 with COPD, asthma, or other existing respiratory/cardiovascular conditions that would be exacerbated by bad air. It also leaves out any impact short of death. 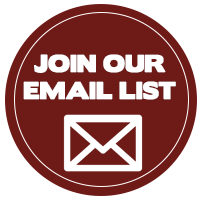 This is especially important when it comes to PM pollution, which has now been linked to a number of neurological diseases like Parkinson’s, Dementia, and Autism, as well as to infertility and immune system damage. Ozone exposure can cause strokes, non-fatal heart attacks, and asthma emergencies. None of these potentially disabling results that fall short of dying are included in the damage assessment of this new study. At a time when the current EPA is seeking every opportunity to roll back, cut back and turn back, this study is a large, unprecedented reminder that the current standards themselves are not protecting public health. Not even close. Citizens must begin to fight for their lungs by reducing the exposure levels across the board, no matter the regulatory status of the pollutant, or compliance of the source. There is no safe level of industrial crap to breathe. That means more than anti-idling zones at schools. California has a recommended buffer zone of 500 to 1000 feet from major freeway corridors for new schools. Dallas -Forth Worth municipalities should expand this idea to daycare centers, parks and senior centers, and solidify it into policy instead of just recommendation. Mitigation measures along those corridor using recycled water walls to “rain” down the particulate matter from traffic, or retrofitting sophisticated new air filters in homes and apartments for citizens are also needed to help those who cannot simply move away from the problem yet. 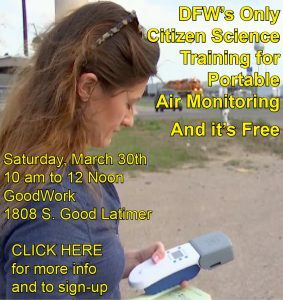 Portable monitors should be bought and distributed to help identify local PM hotspots and catch bad actors or work to lower levels of pollution. The DFW Air Research Consortium’s regional grid of sensors could be used to track PM plumes in real time. It’s clear we’ll get no help from Austin or Washington with these efforts. Indeed, progress will be made despite them. If we have a TCEQ and EPA only interested in pollution promotion, we must fight for more pollution protection ourselves in the places where we live. Previous post: Is that a Disco Ball, or is Your Photoluminescence Experiment Just Glad to See Me?